Please note that this current website does not have a shopping cart. To buy our Wolverine Skins online, please go to our e-commerce website at NaturalExotics.ca. 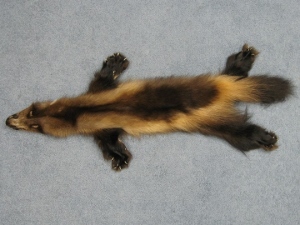 These are real wolverine skins with feet. They may come open or cased (i.e., closed like a sausage). The fur from the wolverine, also known as "skunk bears", is especially nice for making parka hood trim because it does not collect ice crystals.